Everyone agrees: the first Super Mario Land is really, really weird. Turtles would explode when you jumped on them, the Flower power-up gave you a ball that bounced all over the place... things looked familiar but were decidedly different. Now while you could shrug it off and keep playing as a kid because it was frickin' Mario, or as an adult because it felt fresh and interesting, many were still craving a more traditional Mario game on their portable system. So for the sequel, R&D1 looked at what Miyamoto's team was doing for the console Mario games and gave us a more traditional entry: the Fire Flower allowed Mario to shoot the familiar fireballs, Koopas would hide in their shells when you jumped on them and you could them kick them toward enemies or pick them up, the Piranha Plants and Goombas looked more like they did in Super Mario 3 or World... finally, a traditional portable Mario. ...okay, maybe not. 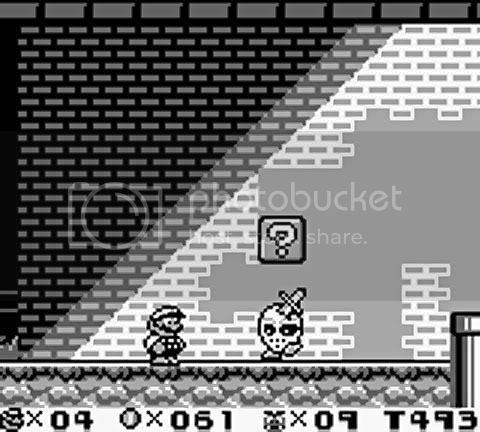 Super Mario Land 2: 6 Golden Coins is close to being as weird as the original. Not only do you fight fish-bull things or ants with bazookas on their heads, but the worlds Mario visits include space and a giant mechanical statue of himself, instead of your usual ice/desert/fire worlds. Not to mention that Mario doesn't cash 100 coins for an extra life anymore, but keeps up to 999 of them to blow at the casino. If you were won over by the weirdness of the first game, you are still getting that here. Only, everything is bigger and more detailed. As mentioned before, the sprites look close to their NES and SNES counterparts, at the cost of visibility: bigger sprites means not seeing as far ahead on the small, crowded screen. To compensate this, Mario and the enemies are a bit slower than usual. Those looking for the exact same physics as console Mario games therefore don't get them here, but it is easy enough to adjust. The controls are different, but excellent. In addition to the Flower, Mario has a new power-up in his arsenal: the carrot, which gives him rabbit ears that allow him to float gently down. Very useful for tough platforming sections and discovering the half-dozen hidden doors in the game that lead to secret stages on the world map. Oh yeah, secrets and a world map: two more enhancements taken from the console games that add even more depth to this game. You can blow through the game's 30+ stages in just a couple of hours, but it is still substantially meatier than its predecessor. The main problem arises from being able to tackle the different worlds in any order: there is no sense of progression, each world is as easy as the last. Only when you collect the titular 6 Golden Coins do you unlock the doors to Wario's castle and face a substantially harder platforming challenge. 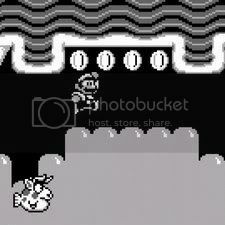 In the end, Super Mario Land 2 is another bizarre Mario game, but a deeper, more ambitious one. In hindsight, it is very much a transitional step between the simple and short Super Mario Land, and the bigger, slower and secret-filled Wario Land. Check it out, knowing you can look forward to something even better! Nice review! I pretty much agree after having played a bit earlier today. The world map and secrets are nifty additions, and the level design--while no SMB3 or SMW--is solid enough. 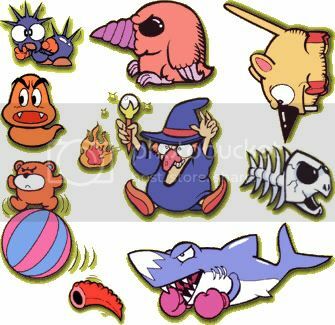 The game isn't without its share of strangeness either, but at least there are a few more familiar elements, including some traditional enemies and a much more characteristic "Mario" look and feel. Probably would be the score I would give it as well if I were to replay it today. I agree with the review a lot. I loved the game as a kid, but recognized even then that it was quite strange. It isn't as good as the console counterparts, but that's no reason to not play a great handheld game. Day one review! Awesome! I'll be buying this game pretty soon. I just want to finish a few other games first. I remember this being good. Not sure if I want to spend the money just to replay it though. I downloaded SML, beat it in an hour, and was totally underwhelmed by it. I'm glad this one's better. I'll check it out! I got this game for Christmas way back when and I was AMAZED by the graphics. Still looks good for an old-school Game Boy game! I went back to it a year or so ago and it was pretty fun. The slow movement sort of kills the excitement, but it's a solid little platformer. Poor Tatanga gets used as a mere end world boss though. Poor guy. I'd love to see him and Wart come back in a big way some day. Nice review Gui! You've told my why I should buy this and I believe you. I really don't have time for it, but I want it there on my 3DS. So when you reviewed it, did you play it on the big kid's difficulty or did you play on easy again? Haha, I played it on normal, of course. Doesn't make much of a difference at all, except in Wario's castle, really. The difficulty is normal by default. You switch to Easy by pressing select on the save file selection screen. I love how this game still has all these quirky elements, despite its gameplay being much closer to the traditional Mario platformer than the first SML ever was. Yeah, the enemies are a strange bunch. I mean, just look at those screenshots you posted! And of course, this game is especially noteworthy in that it introduced Mario fans to the despicable Wario! Remember the commercial? I haven't played this game for years! I used to have the cart as a kid, which unfortunately I sold a long time ago. The Game Boy was my best friend whenever my family and I would drive down to Mexico every year to visit family and friends for the holidays, or for summer vacation. I just downloaded the game last night and look forward to spending time with it all over again. I'm curious to see how much I remember about this game. Yeah, this game was awesome back in the day. I loved it, of course. Back then, it was being heralded as the best Gameboy game ever. It still holds up incredibly well, IMHO. Love that Star Maze theme, too. Head-bopping 8-bit chip-tune goodness! Nice review. This is exactly what I needed to convince myself to go and get SML2 on the 3DS. The only problem is, I want to sell my 3DS and don't want to pay twice for the same games when I get a 3DS Lite. What do I do. What do I do. I'm pretty sure that one will be able to transfer games from one 3DS to another one. So, I am assuming you have a 3DS now, so, as far as selling it, are you meaning you want to sell it now, or wait until the next version of the 3DS comes out and then sell it. I come across these topics across several message boards about Nintendo coming out with a 3DS lite, and yes eventually they will come out with another model, but I am thinking its going to be farther down the road than sooner. I hope I am wrong, cause I want an XL version of the 3DS. I want a bigger screen. And when I see posts and people saying they want to wait until the 3DS lite comes out, by using the word 'lite' do people just use that term for the next version of the 3DS or do people actually think the next 3DS will be smaller? Only reason I ask, is cause I really do not see how the system can become any smaller. Yes, I am sure Nintendo could trim a little off of the 3DS, but its not like the 3DS is even close to the size of the orig. fatty DS...plus, I wouldn't want it any smaller anyways, just like I prefered my fatty DS cause I had more to hold onto than the DS lite. Just curious. Getting back to your prob., if you are going to hang onto your 3DS until the next version, I think you will be fine in being able to transfer the games from on system to another, esp. since Nintendo let people transefer their DSiWare games to the 3DS. I know at the extreme case, you might have to send the systems to Nintendo for them to make the transfer, like you have to do for the Wii, but I am thinking with the 3DS, the consumer will be able to transefer the games on their own. @Guillaume You know what...what the hell. Your review convinced me. I'm buying this game today. @gencid You'll eventually be able to transfer your 3DS stuff to another 3DS in the future. The way to do it is already integrated into the system but the system still doesn't allow you to do it. Maybe in a later update. However, given how DSi to 3DS transfers work, I firmly believe that you will need to have both 3DSes at the same time to do it, unlike with the PSN and XBOX Live, where you can just download stuff from your account into a different system. I've prepared a video showing you how to do it when the time comes. 4. The announcement of the 2nd slider shortly after Iwata's apology to ambassadors, tells me that 3DS "Lite" will be out a lot sooner than what people think (probably as early as Q2 2012). None of this matters though, because Sirmastersepiroth was kind to show me the video about the scheduled system transfer functionality which I wasn't aware of (YES!!!). Therefore I'll keep my 3DS until I get a 3DS Lite and start buying games from the eShop, with Mario Land 2 being amongst the first. Also, to clarify, 3DS "Lite" is only in reference to the next hardware revision. I don't expect the system to get thinner and lighter, but thicker and heavier. That is OK though since the 2nd slider alone is substantial for 3D camera movement in 3D space. I hated gyro controls in OOT 3D and I think they are only good for quick bursts of fun in games like Face Raiders, etc. @gencid I agree. I think a the "3DS Lite" will be thicker, heavier, and coming out next year. I sold my DSi last year after E3 with a promise by Nintendo that you could transfer your games to the 3DS. You can imagine how pissed I was to learn, months later, that I needed the DSi to transfer those games. And then was there was Sony's promise to transfer UMD games to the PSP Go, and then they were like "You know what? We're not going to transfer UMD games or give you the equivalent download. Sorry." Nintendo really needs to change this for the Wii U if they don't want to have the same problems trchnical and PR problems as these systems. They also need to stop thinking that Japan is the only market that exists when designing a game machine. The European and American market are both bigger than Japan so they have to design their systems around thinking about every market. Also, what's the deal with region locking a portable system. Sony isn't doing it, so we know that it can be region free. By the way, I still need to buy SML2. I'll do it today after I get home. I feel bad that I've never actually finished this game. Just finished finding all the secret levels (hence the '31' on my save file) and beating the final boss on my 3DS VC version of the game. This game is just as awesome as I remember it. It definitely can't match the detail and depth of its console big brothers of the time (SMB3 and SMW), but the levels are pretty interesting and fun to play. I had forgotten how much exploration I could really pull off with Rabbit Ears! And there are some particularly 'maze'-like levels, like in Turtle Zone stage 2 (sunken submarine). And that last level... man, that's brutal! Well, compared to the rest of the game. No checkpoints, tricky platform jumping, and the need for patience as you wait for the right moments to make your move. I love how Wario really does become a match for Mario by using Mario's same Fire and Rabbit abilities, it's a cool battle! It would have been nice to have some of that difficulty spread to other parts of the game, as @Guillaume alluded to in his review. And there's plenty of weird stuff as mentioned already, especially that little auto-scrolling level on the map that has no purpose (well, you can earn some 1-ups with the invincibility star, but still seems out-of-place). And it took a little bit of time to adjust to Mario's 'floatiness.' He jumps very high and almost seems to glide on his way down. This made the platforming a little tricky in the last stage. And there are some particularly 'maze'-like levels, like in Turtle Zone stage 2 (sunken submarine). I just got the game and played that level. I hated it. I'm glad to hear that's not what ALL the levels are like! The camera scrolling is pretty annoying, but so far this game is already miles above SML1.